Many people include squats in their regular exercise routines to strengthen and tone their legs, hips, thighs and buttocks. Although squats can be a helpful part of your exercise routine, doing them incorrectly or with bad form can potentially result in a variety of knee injuries. Since many knee injuries have similar symptoms, consult your doctor if you experience knee pain or discomfort to determine appropriate treatment. Patella tracking disorder happens when your kneecap, or patella, moves out of place when your leg bends or straightens. This can cause discomfort or pain when you squat, go down stairs, sit for a long time or stand up after sitting. A patella tracking disorder can also cause popping or grinding when you bend or straighten your leg and a sensation that your knee cannot support your body’s weight. You can often treat mild patellar tracking problems at home by taking a break from squatting and other activities that cause knee pain. Ice the knee area and take over-the-counter pain medications. Ask your doctor for exercise recommendations that can help stretch and strengthen your knees and legs. A meniscus tear can cause sharp pain along your inner knee when you twist or squat. A meniscus tear occurs when you compress or twist your knee joint, which can then pinch the meniscus – or knee cartilage – and rip it. 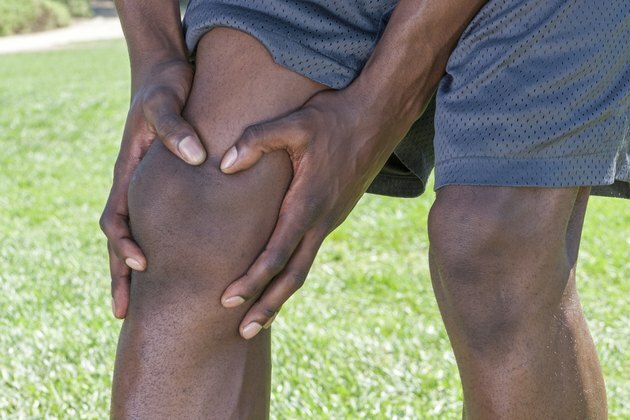 Symptoms vary according to the severity of the tear and might include fluid on the knee, stiffness, and catching or locking of the knee area. Although you can often relieve the pain caused by this injury with ice, wrap, motion and anti-inflammatory medications, you might need surgery to repair the tear. Check it with your doctor. Movements or activities that cause quick or sudden twisting of the knees, such as running, squatting, jumping and landing or changing direction suddenly, can stretch or tear the ligaments in your knees. The ligaments help support your knees by keeping the joints and bones lined up, which enables you to twist, walk and turn. In addition to knee pain, sprains might also cause bruising or swelling in the knee area when the injured ligament bleeds into the knee joint. Treatment involves controlling the pain and swelling through rest, ice, compression and elevation, then doing gentle exercises to help your knees heal. Include regular strengthening and stretching exercises in your workout routine to minimize your risk of knee injuries. Start your exercise program slowly and build its intensity as your stamina and strength improve. Replace your exercise shoes before the padding wears out to minimize the strain on your knees and legs. Maintain a healthy weight – obesity or excess weight can increase your chances of knee injuries.